There is a time and place for hard-hitting, depressing issues novels. And there is a time and place for books that are designed simply to make you happy. 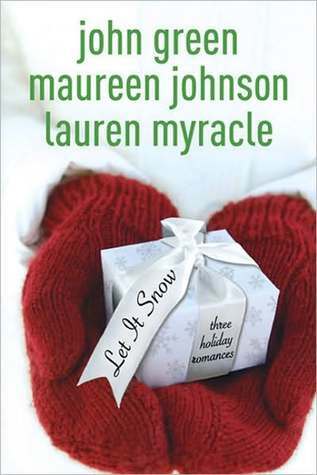 Let It Snow is one of those happy books. Ostensibly, Let It Snow is a Christmas book. But apart from being set at Christmas time, Christmas really has nothing to do with it. The book contains three stories. At around 100 pages each, the word novella best describes each story. They are all loosely connected around a single town but are quite different. Maureen Johnson's story was probably my favorite. It is a good old-fashioned love story. Two characters meet unexpectedly. One is suffering from the effects of a bad ex-girlfriend and the other from a bad current boyfriend. Stuart and Jubilee are unremarkable characters in the best of ways. They are both normal, nice people like most of this book's readers. It's a story of good things happening to good people. John Green's story focuses on adventure. Take three normal (normal geeks at any rate) teenagers and present them with a challenge - get to the local diner in the middle of a blizzard as fast as possible with the reward of a gaggle of cheerleaders (or hash browns, for the girl of the group). And said teenagers will go to enormous, idiotic, life endangering risks to get themselves to said diner. It's a laugh out loud story as the friends encounter one obstacle after another and still press on. The dialogue between the three characters is spot-on. There's a romance tacked on at the end that I thought was unnecessary to an already great story, but I suppose that's the theme of the book. Lauren Myracle's story is a coming of age story that takes place over a few days. Addie is a nice, but self-absorbed girl. She broke up with her boyfriend Jeb because she didn't think he went to enough lengths to be romantic. Now that she's lost him, she's realized what an idiot she was and desperately wants him back. In the mean time, she needs to learn to think of someone other than herself and become a better girlfriend rather than expecting Jeb to be a better boyfriend. A fairly cookie-cutter character development story, but enjoyable nonetheless. While Maureen's story is my favorite simply for the amount of "Awww's" it produced, all three novellas are impeccably written. This is a book that feels most appropriate during the winter but in reality should be on your shelf any time you need a pick-me-up. Let It Snow is simply a delight. I have been wanting to read this for a long time and your review makes me want to push it up on my TBR pile!! Seems like with all this snow it's also the perfect time to read it! I have this one on my shelf...but I haven't read it. WHY?!? I don't know. Obviously, I'm missing out! Oooh, this seems like a fun, sweet read. Something to cozy up with next to the fireplace and a mug of hot tea. I'm in! I've been meaning to read this one for quite some time... I probably won't now, though. It was -22 degrees Fahrenheit yesterday where I live (that's not including windchill). I'll save this for around next Christmas, I think. A nice happy book after finishing a semester! Right now, I'm trying to keep my reading fairly warm. Feel free to stop by if you have time! Have a great week! I've had this one sitting on my shelf for quite some time. I even have it signed both by Green and Myracle when I was at ALA! I should definitely make time to read it especially with the freezing cold weather in Chicago. -40 windchill! These all sounds really good. I will be keeping an eye for this one. Great review. I have been wanting to read this book. I believe I saw it last year and wanted to pick it up but of course never got around to it. Great review. I need to read this book! I bought it last winter, but of course didn't read it (seriously, I need to stop doing that). But I'm hoping to read it during Bout of Books this week. It's the perfect time. I'm glad that you liked it.